Today’s kitchen tip is an easy one, but one I use all the time. I learned this tip from a friend, probably over ten years ago, and I have used it more times than I can count. It is now one of my favorite simple breakfast tips and I cannot believe that I have never shared it on my site. Today I am fixing that. This is a tip I need to share with you all. If you have never tried this simple tip, you need to. Seriously, this will change breakfast at your house. Does your family love pancakes? If they are like mine they do, and if you are like me you love to make pancakes, but you don’t always have time to stand at the stove or electric griddle to make them. If that describes you and your family, this tip is for you. 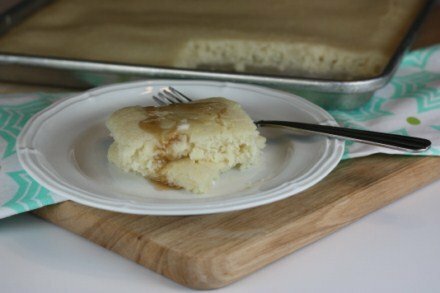 Today I am going to show you how to make oven pancakes simply by spreading your pancake batter onto a jelly roll, or cookie sheet with sides type pan, and bake. I told you it was easy. And don’t they look good. If your kids are like mine, they don’t care what a pancake looks like as long as it tastes good. And these oven pancakes taste good because you simply use regular pancake batter. Here is how you can make these. pancake batter – made according to directions. 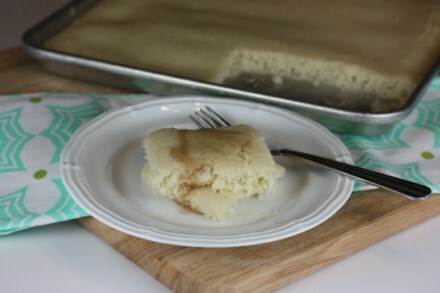 This works with any pancake recipe that uses 2 cups of flour or two cups of dry mix. 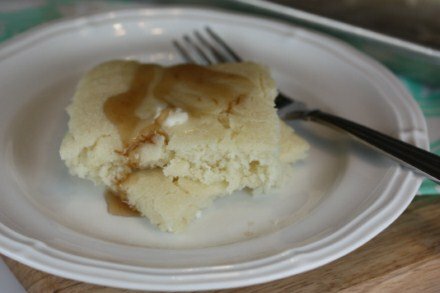 I now use my fluffy gluten free pancake recipe for the gluten free eaters in my family and it works as well. 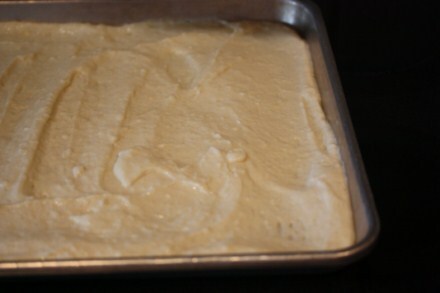 Pour batter into a greased 12×15 or 11×14 pan and spread out evenly. I have done this in various sized jelly roll type pans and as long as they are close to that size it has worked for me. Bake at 375 for 12-15 minutes or until done. It will be similar in texture to a pancake when it is done. Need some ideas for syrup to serve with these. We love buttermilk syrup, apple syrup, peanut butter syrup, or homemade Mrs. Buttersworth. Thank you! I would have NEVER thought of this. I am going to try this idea soon. Thank you so much for this tip, my kids are going to be so glad you shared it! I don’t really mind making pancakes except for the having to stand there and babysit them and then cleaning the griddle, this will make it so simple. I just recently started baking bacon which is awesome, now pancakes, that is so cool! My dad does this with his chocolate chip cookies if he’s in a hurry. They taste just as good but are so much faster. I never thought of doing it with pancakes but my daughter will be very happy now! Since it is important for this not to stick: What do you grease the pan with? Will a cooking spray do or should I actually get butter and smear it on the pan the old fashioned way? I have an oil sprayer, one of those spayers where you put your own oil in it and it works fine with a light coating from that. So, I don’t think you need a lot of greasing for this unless you have a pan that really tends to have stuff stick to it. This is great! Can these be cut and frozen? I dread making pancakes because it takes so long sometimes. Yes, they should work fine to cook, cut, and freeze. It would be a great make ahead and easy breakfast. Fabulous idea!! I was just thinking of making pancakes too. Thank you! made these this morning! too easy! love it, thanks. I am so glad that you enjoyed them! Thanks fore letting me know. My go to for pancakes & waffles. I am glad that they turned out so well for you. This is a great tip! Thank you! We’ve already done this twice since you posted it. 🙂 My family is thrilled. Thanks, I am really glad you all enjoyed it! Think I’ll try heating the pan in the oven first, like with popovers, and see if I can get it to brown more on the bottom, then serve it bottoms up. My husband likes his pancakes brown. Yum! I’m afraid my boys will now grow up thinking pancakes are square! Thank you for sharing this tip. Had these for dinner tonight. Added chocolate chips to half. The kids loved them. OK, we all did, particularly me, cuz we all ate together and they were all hot. My teen son commented that they are fluffier than on the griddle and that’s high praise coming from him. He is in the first year of a culinary arts program through high school, so he’s a tough critic these days. Thanks for posting this!! I made corn fritter/pancakes (adapted your GF Fluffy pancake recipe) for dinner and this was a life saver. It freed me up to fry fish for the main dish. Thank you. Another fab idea! Thank you for linking it! I made this for dinner the other night, and it was so fabulous! What a timesaver, and it tasted exactly like a pancake! And the leftovers the next day were delish! I will be making pancakes like this every time – wow!!! Thank you!! You are welcome! I am glad you enjoyed them. And I agree the leftovers are great. I tried this today the best way ever to make pancakes I’m sharing this with every one I can think of. Thanks for sharing how to make this. Now this is easy. Especially for making pancakes for a big group. I LOVE this idea!!! Why didn’t I think of it myself?! I love to make pancakes but you’re right. Sometimes you don’t’ have the time to stand in front of a griddle making a ton of pancakes. This would be great for holiday mornings because you can spend time with the family and not with the food in the kitchen. I can’t wait to try it out. Lynn, I just had a really good idea. I remembered that you posted this, and I thought, “What if I cut these out with Christmas cookie cutters to make shapes and used sprinkles? ?” I may try this tomorrow, but I am now thinking that there might be some wasted pancake (around the outside of the cutters). What do you think? I think that is a great Christmas idea! Yes, there probably will be some waste, but those parts will still taste good. You could just save them for another day or a snack, or freeze them to eat later. They won’t be as pretty, but they will still taste good! I would love to hear how it turns out. I tried this last night and SUCCESS!!! 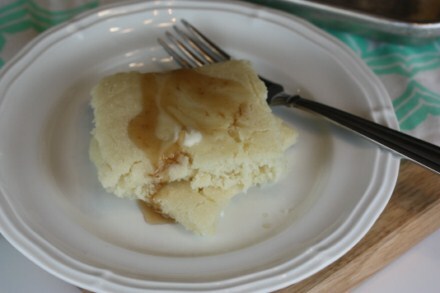 Now, my family all agreed that we prefer the individual round pancakes, but this was super fast and tasty, too!! I’ll definitely do this again when I’m pinched for time!! I’m wondering if a mini muffin tin or regular muffin tin might make round (but thick) and “good for dunking” pancakes?? I definitely am trying the cookie sheet idea! I LOVE pancakes but hate that they get cold so fast! 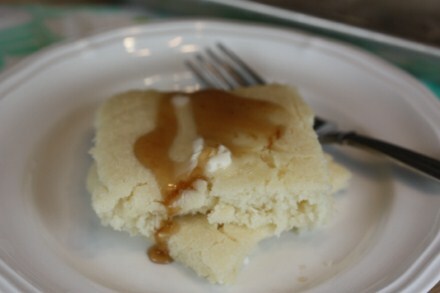 i love this recipe in a family of 9 it is hard to stand at the griddle all morning!!!! THANK YOU! I had just made some batter from scratch, but the pan was to hot, everything stuck to it, hard to clean up, has to soak and I don’t have another pan. I wondered if I could just bake the batter as I vaguely remember eating toad in the hole as a little kid which is basically pancake mixed poured over sausages in a pan and put in the oven. Your page came up on google, and saved my day! You have NO idea how much nicer?easier this will make my Sunday morning breakfasts!!! Actually, you do! ;D THANK YOU!!! Cooking pancakes in the oven, what a genius idea! I like the texture better this way because it feels like the pancake is cooked more thoroughly, but it still has that pancake texture to it. The only thing I struggled with a bit was getting the finished pancakes out of the pan, though it’s possible that I needed to put more grease on the pan. Did you have a similar problem the first time you made these? I am glad you enjoyed them! Sometimes I do have a little trouble with them sticking. It depends on the pan I am using. You could try greasing it more. My favorite pan to use for these are the USA pans. Thank you for these instructions. A lifesaver if you are trying to make a ton of pancakes for 2 little ones. I read somewhere that if you broil for just a few minutes after the bake (obviously watch them carefully or they will burn) you can get them to brown on the top. Though the bottoms turn out a bit soft (but still cooked), I line the bottom with parchment paper so there is never a sticking issue. Found your blog because I was looking for a recipe like this one. Made this yesterday for my boys (ages 4 & 5). They were a BIG hit! Now I can’t wait to try other recipes from you. I like that you’ve made it both time and budget friendly. My four year old just looked over my shoulder and saw something else he wants to try! Thanks Lyn and merry Christmas to you and your family. Or as we say down here, happy Yule y’all!! I am glad that you enjoyed it. My kids love these and I love how easy they are to make. Thanks for letting me know how much your kids like them. Merry Christmas! Go to the dollar store and purchase a styrofoam tortilla warmer. Cut pancakes into serving size pieces and put in tortilla warmer, your second and third helping will be just as hot at the first! I use this for regular pancakes all the time. I had these 40 years ago. Little smokies were put into the batter so you had your sausage mixed in with the pancakes! I stirred in cooked ground breakfast sausage, but not little smokies. I love that idea though and will have to try it!